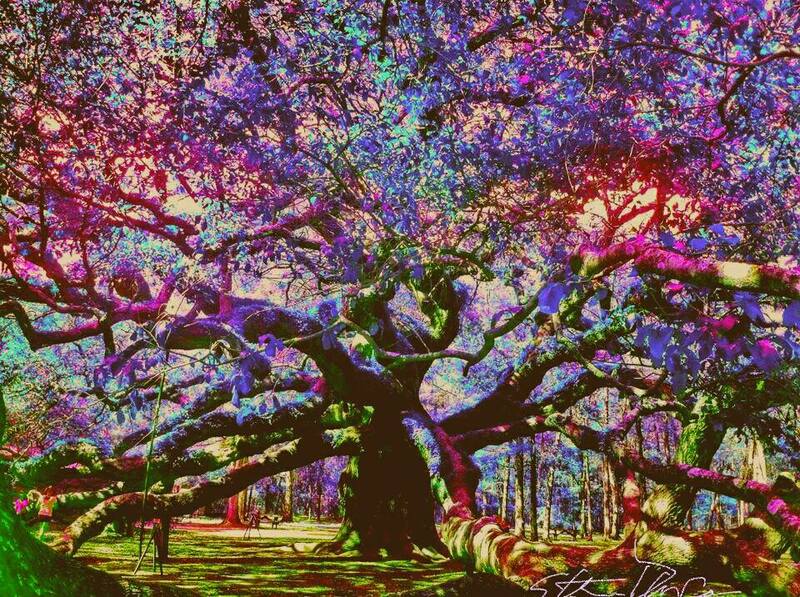 “Angel Oak” by Stefan Duncan. Prints will be available. If interested in one, let us know 13 by 19 velvet sheet, image with 1.5 or so margin on the sheet. 1/100. $50.00. Purchase of one of these prints we will include a $10 coupon that can be applied to another print of the future you may like to get. Signed and numbered. 24 by 30 acrylic $2k and 30 by 40 acrylic on canvas $2.8k. (Please for artists’ sake, don’t just print something yourself, but from the artist. This is… our living. I could place a big fat watermark across it, but I wanted you to see the pure beauty of the work.) We can also create acyrlic prints, embellished prints, that are signed and numbered. We will also have a 1/100 limited issue. Angel Oak is located in John’s Island, a few miles from Charleston, S.C. She is majestic and simply glorious. I filled her with “spirit” color. Imagine having this hanging in your office or home. She will literally transform your room into something magical that will take your viewers by awe. Imagine the room is semi-dark and you have a single low light on this. It is literally neonic. Angel Oak is a Southern live oak (Quercus virginiana) located in Angel Oak Park on Johns Island near Charleston, South Carolina. Angel Oak is estimated to be 500 years old. It stands 66.5 ft (20 m) tall, measures 28 ft (8.5 m) in circumference, and produces shade that covers 17,200 square feet (1,600 m2). Its longest branch distance is 187 ft. in length. Angel Oak was the 210th tree to be registered with the Live Oak Society. Angel Oak is a tourist attraction for those visiting the Charleston, South Carolina area. The tree stands on land that was part of Abraham Waight’s 1717 land grant.